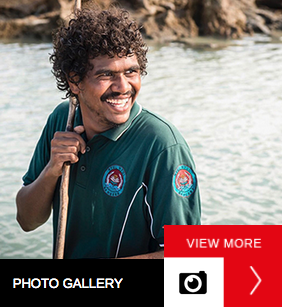 Two decades after their native title claim was first lodged, the Mayala native title holders have today been recognised by the Federal Court of Australia as the Traditional Owners of their country in the Buccaneer Archipelago and King Sound in the Kimberley region of WA. The consent determination, which was delivered by Justice Barker at Ardyaloon (One Arm Point) community on the Dampier Peninsula, recognises both exclusive and non-exclusive native title rights across 3,833 square km of land and water north of Derby. First lodged in 1998, the successful claim includes exclusive possession rights across almost all of the hundreds of islands in the native title area, including major islands such as High Island, Long Island, Mermaid Island, Hidden Island, Irvine Island and Bathurst Island. It is the third native title determination to occur in the Kimberley this year and means the Kimberley is now approximately 84 per cent native title determined. Traditional Owner and Applicant Valarie Wiggan said she was proud to see the claim finally determined. “I’ve been involved in this claim since it started 20 years ago, when my mum was on it, and she has been gone 18 years now,” Valarie said. “I know my mum and uncles would be very proud and excited for this claim to be determined. Kimberley Land Council Acting Chief Executive Officer Tyronne Garstone congratulated the Mayala native title holders, acknowledging the many years it has taken to finally receive native title. “Today is an historic moment for the Mayala Traditional Owners who have waited a long time to be recognised as native title holders,” Mr Garstone said. “Native title gives people real rights and a real say about what happens on their land and waters. It proves, at law, that the Mayala native title holders have a continuing and unbroken connection to their land and waters that spans thousands of years prior to colonisation. “Since this claim was first lodged many people have passed away. I would like to pay my respects to and acknowledge those who have fought tirelessly to get their country back. “Now the challenge is to ensure that these hard fought native title rights are maintained and strengthened, rather than being subjected to the threat of extinguishment or compulsory acquisition. The Mayala native title holders, in accordance with their traditional laws and customs, identify themselves and their forebears as Mayala, Umiday, Jawi, Uwini, and Ungurrangu. They belong to a unique archipelagian society associated with the islands of the Buccaneer Archipelago and have a distinct maritime culture and deep knowledge of the tides, currents, islands and reefs of their traditional country.